This is a good bowl of food. Savory, crunchy, a little sweet from the coconut, a little spicy from the curry paste. 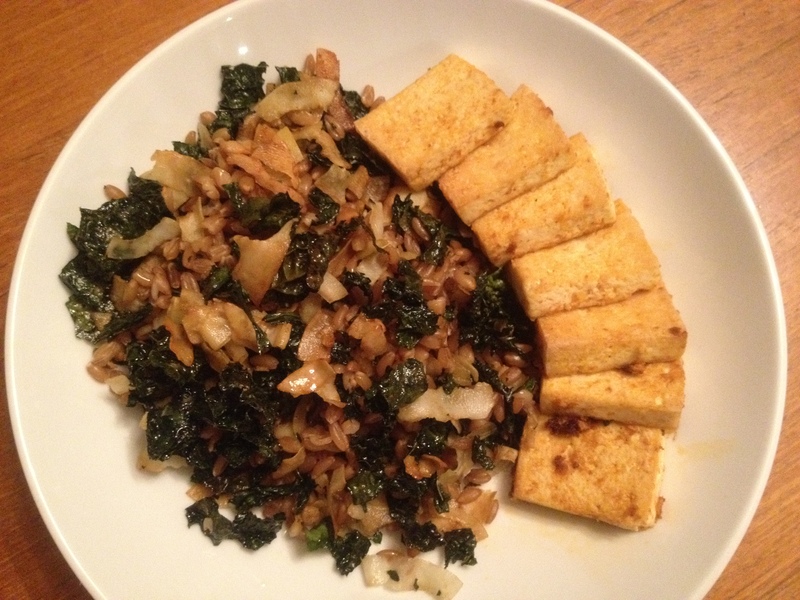 Whole grains, crispy-chewy kale and coconut, bouncy roasted tofu. I used farro because I happened to come across it while I was thinking about this recipe, but brown rice would be a perfectly acceptable substitute. And if you have ever made kale chips, you have some idea of the magic that’s going to happen here. This combination is based on the kale salad in Heidi Swanson’s Super Natural Every Day, but with a bit more kale, less oil, and with tofu added to make it a more complete meal. It sounds a little complicated, but once the grains were cooking, the rest came together quickly. The results were deeply flavorful. This is one of those recipes where the final dish seems to exceed the sum of its parts. Farro Bowl with Toasted Kale and Coconut and Curry-Roasted Tofu: First, put a pot of farro or brown rice on to cook (I cooked my farro in homemade vegetable stock and then saved the drained liquid to make chili). Press a block of tofu if you like to do that sort of thing. Slice tofu into dominoes and brush with 1 Tb. melted coconut oil mixed with 1/2 Tb. Thai curry paste and a sprinkle of salt (I used red curry but another type would be fine too). Spread the tofu on one end of a rimmed baking sheet and put it in the oven at 350. Wash and dry a large bunch of lacinato kale and chop it into small pieces. Add 1 1/2 c. large-flake unsweetened dried coconut to the chopped kale. Make a dressing with 3 Tb. olive oil, 1 tsp. sesame oil, and 2 Tb. soy sauce. Toss kale and coconut with dressing. Remove tofu from the oven and turn the pieces over. Spread half of the kale mixture alongside the tofu and the other half of the kale mixture on a second rimmed baking sheet. Bake for 15-20 minutes, stirring occasionally, until the coconut is deeply browned (switch the top and bottom trays halfway through baking). Once the kale is done, mix it into about 2 c. warm cooked farro. Taste and adjust with a few more drops of olive oil or soy sauce if desired. If you’d like the tofu crispier, turn on the broiler for a few minutes and return it to the oven, watching carefully to avoid burning. Serve tofu alongside the farro and kale salad. This entry was posted in Salads, Tofu, Vegan or Would-Be-Just-As-Good-Vegan and tagged cooking, DIY, family, food, healthy, homemade, kale, lifestyle, recipes, tofu, vegan, vegetarian, whole grain on April 3, 2012 by emmycooks. This is an interesting recipe…I have only had farro in Italian recipes. ooooh–this looks great and i love the coconut-curry combo!! will have to try this asap! thanks emmy! I did like the riff on the curry-and-coconut milk combo. And I REALLY liked the big toasty flakes of coconut. I hope you enjoy it as well! We really do like the same things Emmy, and I tell you I would be more than happy *overjoyed in fact* to have this served to me! Looks fab!!! Absolutely beautiful dish. Thanks Emmy. You are so welcome, J. Looks absolutely delicious. I love all the flavors and textures that you have going on in here. Yum! 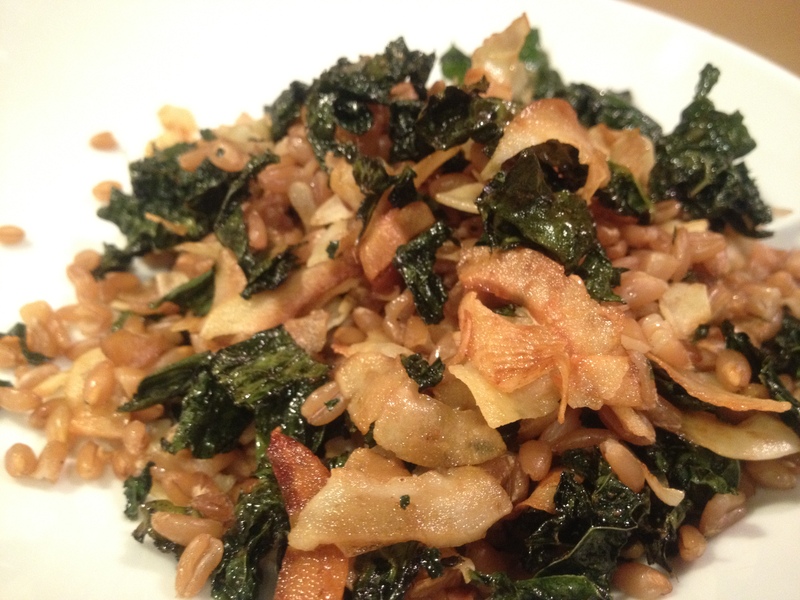 It really is all about the textures–chewy grains, the crunch of the kale and coconut. I see this dish again in my very near future.